So you want to buy stocks? Maybe you're interesting in investing in direct stock purchase plans? Great! But you only have a small amount of money each month to invest? You're worried about any potential returns being wiped out in the beginning by brokerage fees? You're wise to worry. Invest $100 bucks per month with a discount broker and you're lucky if you pay commissions equal to seven percent of your investment. Seven percent! That's a decent annual return, and you're giving that up at the start. Yikes! Of course, you could save that hundred dollars, month after month, until you have a pile of money to invest, but then you're forced to determine exactly when to buy, forced to time the market. You know this isn't a good strategy. You want to dollar-cost average your investments over time, investing a fixed amount each month, on a schedule, so that you acquire more shares when the share price is low, and fewer shares when the share price is high. I want to share a secret with you. There's a better way. Hundreds of companies that trade on the major stock exchanges allow you to buy shares directly from their transfer agents for very little or no money. Years ago, I began buying shares of Kellogg Company (K). In the beginning, I had only $50 per month to invest. Over time, I increased my monthly investment in Kellogg to $150 per month. That money is debited from my checking account by Kellogg's transfer agent, Wells Fargo, and used to buy Kellogg stock through their Direct Purchase Plan. According to my 2008 year-end statement, I own 142.212 shares of Kellogg. Over all of these years, for all of these transactions, I have paid no fees to accumulate these shares. Not a dime. All plan administration costs and share purchase costs are paid by Kellogg. Plus, every quarter, when Kellogg pays a dividend to shareholders, my dividend money is automatically used to buy more shares — at no cost to me. 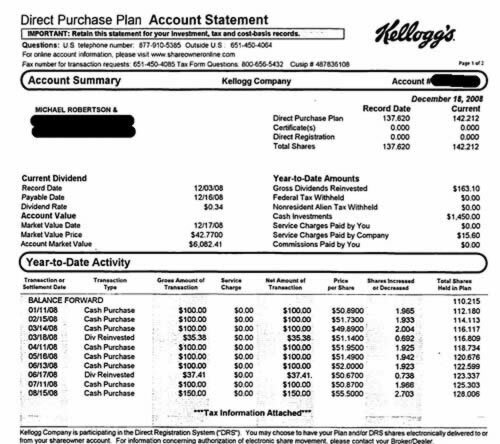 On December 16, 2008, a $46.79 dividend payment was applied to my account and used to buy 1.065 additional shares of Kellogg, at no charge to me! I also buy shares of Pfizer, Inc. (PFE) every month through their transfer agent, Computershare. Pfizer's plan also costs me nothing. I've slowly acquired almost 160 shares of the company, a little bit every month, without paying a dime in commissions or fees. Zip, nada. Like Kellogg, I get a statement in the mail every month, and I can track and manage my account online. I invest $150 per month in General Electric's plan through their transfer agent, BNY Mellon Shareowner Services, and they charge $1 per purchase. So, only $149 of my $150 is used to buy GE shares. Of course, that's a lower cost than any discount broker. And my quarterly GE dividends are reinvested (used to purchase additional shares) at no cost. Microsoft (MSFT) switched transfer agents in the middle of last year, from BNY Mellon to American Stock Transfer & Trust Co (AST). Unfortunately, in this case, the cost of my $100 monthly investment in Microsoft went from $2 to just under $3. Of all the plans I've looked into, the flat $5 fee I pay to invest $200 each month in Toyota (TM), is the highest I have seen. Toyota's transfer agent is BNY Mellon, and I suspect the cost is higher because it is a foreign company, though traded on the NYSE. But remember, any search on this site will return only companies for which Computershare is the transfer agent. If the company you search doesn't come up, go first to that company's website to determine who their transfer agent is, and whether they offer a direct purchase plan. Determine what stock you want to buy. On the “investors” page of that company's website, look for an FAQ link. In the list of FAQs, find one that regards either buying stock directly from the company or a dividend reinvestment plan. The corresponding answer will contain either a link to the company's stock transfer agent, or a statement indicating that they do not offer such a plan. Assuming they offer a direct stock purchase plan, and there is a link to the company's stock transfer agent, use it. On the transfer company's website, you will find information specific to the direct stock purchase plan for the company in which you are interested. This information will include costs associated with participating in the plan, a minimum amount required to open a plan account, and the minimum monthly investment amount. If you are still interested, follow the transfer company's instructions for opening an account. This will include entering your name, address, SSN, bank account information, monthly withdrawal amount, and whether you want dividends paid or reinvested (when applicable). You will soon be a shareholder. So, why doesn't everyone do this and why aren't discount brokers out of business? There are a couple of reasons. First, when you buy a company's stock through a transfer agent, you don't have to participate in a monthly purchase plan; you can make a single, one-time purchase of a fixed number of shares. But, regardless of whether you make a one-time purchase or sign up to invest monthly, you have no control over the respective trade date. Not many people would feel comfortable committing to invest a chunk of money, say $10,000, in a company at an unknown share price. When you use a transfer company to buy shares directly, the transaction may not happen for a couple weeks, and the purchase goes through at whatever the price happens to be at that time. Of course, if your aim is to dollar-cost average your share purchases over a long period of time, this is not a factor. Second, companies that offer these plans don't spend money to advertise them. Contrast this with the inescapable pop-up ads for brokers like E*Trade and Sharebuilder on finance-related websites. Is it any wonder people think brokers are the only means for buying equity shares? 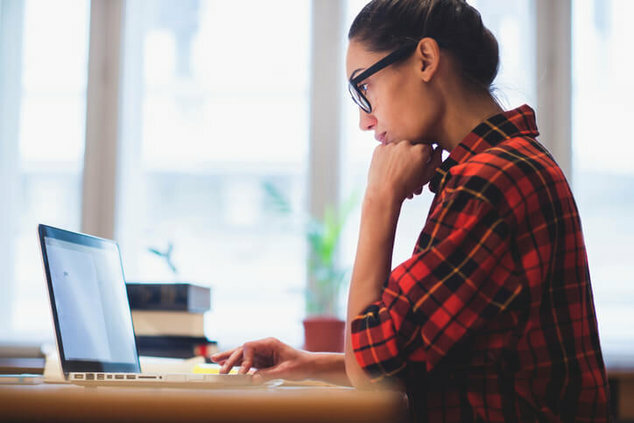 For the small investor who is ready to buy individual shares of a particular company, a direct stock purchase plan may be the smartest and most thrifty way to do so. J.D. 's note: Before you invest in the stock of individual companies, be sure you understand the concepts of diversification and asset allocation. Buying individual stocks is great for some investors, but others are better served with low-cost index funds. There are 117 reader responses to "How to Invest Using Direct Stock Purchase Plans". Thanks for the write-up on these plans. One thing I was wondering about is if these plans are eligible for minor/custodial accounts? I’d like to invest a little money in kid-friendly companies with my kids as a teachable lesson. This seems like a low-cost, low-frills way to do it. Yes, most of them have the ability o set it up as a custodial account. We have shres from our employers for the ESPP, but also buy direct through ComputerShare for the kids. Very nice tip. This will definitely be very attractive for many people who are into investing. This is great news! I’ve recently been buying GE stock and would never have though of buying directly like this. I certainly like the idea of not paying (or paying VERY little) to buy stock. This is why I prefer Fee-Only Financial Planners. They can help mitigate the risk, and don’t have brokerage fees. You pay for their professional knowledge – not a salesman. Although, I’m still fighting debt and not ready to invest, this struck me a fantastic tip to those who are just starting out. I have never been exposed to the concept of buying directly. When dollar cost averaging this seems to be a great strategy to minimize costs! Are you talking about something similar to ShareBuilder.com? I’m an index investor, but I own index mutual funds rather than spyder’s because of my relatively small purchases. I invest $150-$200 every two weeks, when I get paid, into the market. As is stated in this article, I didn’t want to pay the brokerage fees for to buy spyders. With these funds, I do not pay any service fee to buy them, though I do have a 3 month holding period (I don’t buy to sell anytime soon). I end up paying a higher MER, but I feel it works out because of the way I buy the funds. I think it should also come with the caveat that these plans are for taxable investing. To investing in an IRA requires going through a brokerage. Not really. There are some Direct Stock Purchase Plans (DSPP) that offer IRAs. I believe, Altria (MO) at Computershare is one. There are others. You’ll have to do your due diligence. 1) It takes time – you need set up an account for each company. If you want to have a diversified collection of stocks then the time factor will add up. 2) Diversification – if you don’t have much money to invest then you will be far more diversified buying index funds. 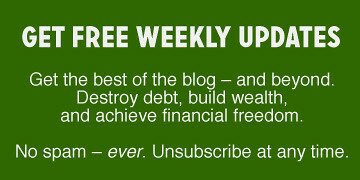 If you don’t have enough for the Vanguard minimum then save it up and open an account there. Once you have a large enough portfolio of index funds ($50k?) then maybe you can consider individual stocks – at that point you have enough diversification that a few small stock positions won’t increase your risk much. 3) Trading fees aren’t necessarily that much – if you want to buy stocks at an online brokerage then don’t buy $100 worth every month – save it up until you have enough so that the fees are less than 1%. If you don’t have enough money to make this worthwhile then do the index fund route or just don’t buy stocks – spend your time increasing your income or cutting your costs. 4) Accounting – if this account is not tax-sheltered then you have to keep track of all your purchase costs and dividends. Doing this for a handful of stocks is far more work than it is for one index fund. This is interesting. Buying individual stocks is not something I’d want to do at this time in my life, but it’s nice to know that if I were ever interested, there’s an economical way of doing it. Great of you to mention these – I’d totally forgotten about direct plans, even though I know that’s how my grandfather bought all his stocks. We bought GE lately too. I’d never want stocks to make up a large percentage of our portfolio, but I think my husband will love this idea. Looks like you can make purchases with them monthly automatically, or as (in)frequently as you’d like. Too bad they don’t have the completely free plan! How do you sell shares with this method? Do you just put in an order with the transfer agent and they execute the trade and send you a check? This looks like a promising idea, but only for those who are looking to invest in a small number of stocks. If one wanted to do this for, say, ten different companies managing it becomes the equivalent of managing ten bank or credit card accounts each with their own monthly statements and tax reporting information. Managing that could become overwhelming beyond a certain point. For those who may not buy & hold forever, figuring cost basis for shares sold is not trivial, though if I can do it, anyone can. Though DRiPs were fun for a while, I’m back to index funds. The principle of dollar-cost averaging is essentially ShareBuilder’s strategy, but ShareBuilder is still a broker for the transaction(s). Direct-purchase is just that, no middleman. With ShareBuilder, the purchase of additional shares is typically automatically scheduled. With direct-purchase, you MAY have to set that up manually. It depends upon the transfer agent. In most cases, yes, the transfer agent can handle the sale. Read the fine print though, as there may be exclusions to when transactions are executed and how funds are remitted. It’s also worth pointing out that shareholders actually OWN the shares, regardless of whether they’re brokered or directly purchased. If you bought shares directly, you can very easily transfer those shares into a brokerage account, usually for free. Expect your broker to charge you a nominal fee for transfering shares out, but it can be done. I like this idea in principle, especially for cheap ways to invest in other companies, but it still gives me caution to not control the stock purchase date. I have been doing this through my own company for some time and because the stocks are purchased on a given day, they just go at the available price and don’t do anything with timing. The stock may be 15% lower the day before and day after and sometimes even the same day. Seen it happen too much. Also the fees if you sell shares through Computershare at least are outrageous compared to a discount broker. Thanks for the great tip! I had no idea that companies would let you buy stock this way. Meh…I think I’ll stick with index funds for my dollar cost averaging. That way there’s some diversity built in. Besides, if there’s an individual company I eventually decide I’d like to invest in, I’d rather purchase it at a known price all at once (more of a speculative for-fun investment, I guess). Agreed with the above comment from ABC’s of Investing. The plan is the best way to invest in individual stocks, but are individual stocks the best way for you to invest? Chances are you need to be more diversified. Buying individual stocks is not the best plan for me. I’m not Warren Buffet, and I don’t have the networks to know the good stocks from the bad. This is gambling. Fee-only advisors are still salesmen.. Trust me. The problem is aligning their interests with yours. If you are paying a flat $300 fee or whatever, what is the advisor’s motivation to grow your account? You are paying $300 no matter what, right? I believe you can still be a “fee only” advisor if you charge a % of AUM, normally .5%-1.5%.. That makes a little more sense to me because the advisor’s payout is directly affected by the value of your account. You make more money, he makes more money.. Interests aligned. Now here is the real problem.. Say you have a $50,000 account.. A 1% payout on $50,000 is $500 a year.. What you don’t know is that MOST advisors only receive 30-40% of that revenue.. So now the advisor is actually getting paid (on a good day) $200 BEFORE TAXES on your account a year.. How much time and effort do you think a worthwhile financial advisor is going spend on a $50,000 account. Very little, I’m afraid. This is a great tip for saving money on trading fees. In my opinion, however, if you only have 50-100 per month to invest, it might be smarter to be putting that into a retirement account (likely a Roth under these terms) that’s invested in low cost index funds. Individual stocks are a great way to build wealth, but they’re likely not for everyone. It’s a good post though, with a good tip as to how to buy individual shares without your funds being eaten up by transaction costs. The title of this article should be “Direct Stock Purchase Plans: A *Cheaper* Way to Invest”. I’d never use this method, personally, because it seems like way too much of a pain. I’d much rather just pay the $7/trade. If it’s that big of a percentage of your trade value, trade quarterly instead of monthly and reduce the fee by two thirds. Of course, I have no interest in buying individual stocks, anyway. It would force me to spend for too much time tracking and researching a lot of things I don’t care about, and would therefore be a big waste of my time. Thanks for the advice, I think I’ll work on reinvesting my dividends into buying more stock instead of letting it sit untouched. This sounds good in theory, but I wonder how it actually works in practice. Not being able to decide the trade date is worrying, but I also saw no mention of trade price. Do they say you’ll get the market rate on the day of the actual trade. If they charge you more than the market rate, that’s a hidden fee. Secondly, and perhaps more worrying, is how you close these positions. When I sell, do they pick the date and the trade price as well? Seems like there’s the opportunity for more fees in this scheme. At least using brokerage firms I know exactly what costs I’m paying. If you really are buying to hold for the long term like retirement or college savings, then this is a horrible method. One time transaction fees are nothing compared to the tax consequences of quarterly dividends and long term capital gains over the life of an investment. You would be better off investing in a tax sheltered (IRA) CD earning 3.5%. Great article! Glad to finally see DRIPs get some coverage. I’ve had them for years, my dad got me into them when I was a kid. Excellent way to teach kids about stocks. I think it’s a very interesting idea, especially if you feel a connection to the company you buy shares of. However, I don’t have a clue if something similar is available in Europe/for Europeans. Does anyone have information about this? Interesting info., not sure I would use this plan because we do our individual stock purchasing within our IRA, with a plan to conver to Roth IRAs in 2010. Our 401ks are invested with mutual funds and index funds and we also have real estate investments. The monies we use to buy individual stocks in our IRAs is about 30% of our investment monies (not counting RE). One downside of using direct purchase plans is the resulting influx of statements. It’s just so much easier to organize one statement from one broker and one 1099 from one broker than a stack of statements and a stack of 1099s from multiple plans. You may also have less liquidity. Have you ever wrote about the difference in the various types of financial planners? There was some discussion above about compensation of fee only vs. commissioned based planners. There are also fee only planners out there who charge a fee based on someone income statement net worth, not their balance sheet or assets under management. It would be interesting to hear from both sides and how they present themselves, and the get the readers opinions of who is best, or looking out for the investors best interest. This is all about dollar cost averaging. I do it. Have done it for about ten years. At this stage of my life, I reinvest all dividends. I do not do automatic investment monthly. I send in optional payments when I can. DRIPs are applicable ONLY after you fund your IRA and your 401K (if you have a job) and your Keogh (if you have one) and your emergency funds and your college funds, or whatever other normal savings vehicles you have, including mutual funds. IF and ONLY IF you have money left over, DRIPs can work. It does take courage though. Who knows if Kellogg or GE or P&G or any other company you invest in will be around basically “forever”? I’ll bet plenty of people expected Enron and Lehman Brothers and a long list of companies who no longer exist to last a long time. So like all investing, it is gamble. But so is life in general. As mentioned before, these programs give you terrible bid-ask spreads, hiding the true cost of the plan. Great advise!! Spent all my money on Citi stock month ago!! :( Hopefully it will shoot up soon. There is really no right or wrong answer to which financial planner is best. Personally, I think a one-time fee eliminates many of the exterior motives, for the majority of people. However, it’s not right for every situation. For example, what if the client just needed help with a rollover. Is that fair if a a planner charges him the same as someone who needs a complete overhaul? As you can see it can get pretty complicated. Also, the conversation always leaves out the most important aspect, and that’s the quality of the planner. This goes completely against the “low cost index fund” advice we see on GRS all of the time — specifically why, I think, JD mentioned this at the bottom of the post. I would guess that 95% of all people who own individual stocks have no business doing so. They should be in index fund. Set and forget. A friend was just talking about a money manager site. Have you seen sites like this and do they really help? All DRIP plans are not created equal. Look at the fee structure and determine if it ora low cost brokage account would be your lowest holding vehicle. I would like to re-emphasize the huge burden of tracking all of the stock information through DRIPS for tax purposes… if you notice on his statement, the company does not do it for you. monthly (or even bi-monthly) stock purchases, plus quarterly dividends over an extended period can become quite a headache tracking your average share price, if you ever want to sell. and if you are planning on doing something like this as a retirement substitute, consider tax-sheltered accounts first. I love DRIPs (Dividend Reinvestment Plans)– a very smart way to dollar cost average in to stocks . . .
Not enough detail, not a very good article. I still no not understand how to go about this. Telling people to buy and hold and blindly diversify is now considered bad advice. Please stop doing it. I own shares in 14 different companies using direct purchase plans, it’s not that time consuming. Most send quarterly statements when dividends are paid. My children also have custodial accounts. My accounts also have a TOD, so I’m able to avoid probate with these investments. Most utility companies offer these plans & are a low risk investment. P&G also offers direct purchase & does stock splits on a regular basis. Companies also tell you when purchases are made, such as the 15th & 30th of the month. can you give a step by step of the process with Coca Cola? I looked up Coca-Cola(KO) on Yahoo Finance, there is a link to the company’s website. Once your on Coke’s website look under investor relations — it tells you what you need to know & links you with Computershare.com. Computershare.com has all the nitty-gritty details of costs & forms to either download or send for. When filling out the forms you can add TOD even if they don’t have an option for it. Hope this helps. A particularly good post. Even as much investing reading as I’ve done, I hadn’t read of these before. I would point out that the 7%-if-you’re-lucky figure comes from the assumption that the $100 is invested immediately. If one leaves the money there in the discount brokerage account– usually earning interest– until next month, the investment expense is cut in half. Or thirds, if you invest only every quarter. Why would a company want to allow direct purchases of its shares? Is this a form of fund raising by companies through the issuance of shares…slowly but surely? If that is so…there is a constant, slow, but sure dilution of shares right? I’ve dealt with clients who buy stocks this way. I agree with all the points above, but many times clients have a tough time keeping track of all their shares! Maybe I’m preaching to the choir here, but most investors are not organized at all – sometimes it’s a brokerage account with one statement and one place to monitor that make’s it all come together and make sense. This is a topic that is near and dear to me. I have my own blog dedicated to this topic (http://directstockpurchase.blogspot.com/). I am a big proponent of participating in direct stock purchase plans (DSP) and DRIPS. I have read most of the comments here and investing in this manner is not for everyone. Like someone said, this is all about dollar cost averaging. It is finding the least expensive way to dollar cost average your basis. I have been participating in this for about 10 years now. Over time I have invested in many companies including Pfizer, Exxon Mobil, Paychex, Schnitzer Steel, Duke Energy, General Mills, etc. From a return perspective it has worked out for me. Maintaining records and determining cost basis can be a challenge. I have created a spreadsheet for myself, which I have used the last several years to calculate my tax basis. Someone mentioned that rather than invest small amounts every month, one should save up the small amounts and invest lump sum at the end of several months. For people that do that, 8 out of 10 times they are going to time the market badly and will most likely end up purchasing at a high. I would rather buy monthly and average out my purchase price. But when I check the sell policy for the stocks I see I lose what I made by saving on the buy. For example GE : when I want to Sell they charge me $10.00 and then a 15% of each share. That is a direct lose of 15% – Am I missing something here? I beleive it is $10.00 plus $0.15/share. So, if you are seling 100 shares of GE, you will end up paying $10.00 + $15.00 (0.15*100). You will pay $25.00 for the sale. It is usually 10/12/15 cents a share and not a percentage. How do I take advantage of purchasing stocks with out a broker AND purchasing them when ever I want? That way I can buy and sell whenever it is favorable according to the share price. I don’t want to end up buying high and selling low just because those are the dates I have specified with the company. I do not recommend using any Direct Stock Purchase Plans of company. These programs have definite disadvantages. 1. No instantaneous sale of your stock. Most of these stocks are allowed to sell the stock a time period of 3 days. You have no control. 2. Proceeds of stock sent per check. I could not believe but both BNY Mellon (operator of GE Direct Stock Purchase Plan) and PG Shareholder services still send all the proceeds from a stock sale via normal mail and not via ACH deposit to bank account!!! 3. Dividend reinvestment is tax nightmare. When you sell your stock you have to use the price of the stock at the time of stock purchase in order to calculate the profit for your taxes. This means if you have owned stock for 10 years and reinvested 4 times per year (quarter dividend payments) you have to call the difference from purchasing and sale price over 40 times. Keep away from DRIPs only if you intend to use dividend reinvestment in an IRA account. Only then do you not have to worry about these tax problems. The bottom lines is that these three issues have made me drop all of my direct stock purchase programs (GE and PG). Go to a online broker and you will be better service and avoid these problems. I feel like most people don’t know about this so I think it is great you wrote an article on it. My boss at work does the same thing with Exxon and Chevron stock which he is using to pay for his kids’ college costs. The low fees really help out considering he wanted to dollar cost average and reinvest dividends. I like the idea of stock that pays, but I sometimes have ethical concerns. What suggestions do you all have for ethical stocks that are responsible to employees, environment and long term financial returns? If you do a google search for ‘ethical stocks’ or ‘socially responsible stocks’ or similar keyword searches then you can come up with various lists. for example Dividend Channel has a top 25 list of socially responsible dividend stocks. One big problem with DRIPping (and automatic investment plans) in general, especially if you’re only in a few stocks, is that your portfolio can get out of whack in terms of diversification. When you keep buying more and more stocks from the winners, you end up with a larger percentage of these specific stocks in your portfolio, and a negative shock to one or even a few companies can really take your net worth down almost instantaneously. It’s important to keep in mind your current allocation when deciding where to invest new money, or to rebalance from time to time. Great comment Nicole. Direct Stock Purchasing Plans can be a lot of fun and help an individual learn about investing, but as you and J.D. point out there are dangers to putting a sizable investment for retirement, college, etc. into one or a couple of stocks even if it is only $100 a month. For around 4 years I had put $50 to $100 month into GE ranging from anywhere from $30/share to $45/share. With its diversification I thought it would be similar to a mutual fund with the fun and adventure of investing in a single company. I never realized how heavily tied it was to finance and in 2008 the price went from around $40 a share to the low teens and still hasn’t gone back over $20 a share. I’m thankful this wasn’t essential retirement or other types of savings. It was fun, but even investing in a couple of ‘solid’ stocks may cost you dearly without diversification. For investors with small amounts, I’d suggest using commission-free ETFs instead. It’s also low cost, with a low minimum, and you get far better diversification. TD Ameritrade for example offers a long list of ETFs on a commission-free basis, and I don’t believe there’s any minimum initial amount to open an account. I would like to go for ETF route as well. Assessing performance and portfolio value is not easy going by direct route. I did read about this post from GRS archive before. Explored the opportunity. If an investment is not showing up on my Mint or Yodlee tool, I am not going to put my money there. Never knew about this. Going to ask my husband what he thinks of this. So much to learn about how to invest one’s money for the future. If you find investing boring or frustrating, that’s ok. There are “lazy” portfolio solutions that will match the market at low cost for you. My favorite is the Vanguard Target-Date fund… they’re the lowest fee Target-date fund and all you have to do is pick one date, the date you think you might retire, and it takes care of everything for you– diversification, stock/bond allocation etc. Given that most people who try to beat the market fail, there’s little reason to do anything other than try to match it with as little effort as possible. The downside to this strategy of course is not having the ability to see all your investments in one place. Re-balancing a portfolio can be a headache. And in many direct-buy programs one may not be able to liquidate their portfolio quickly. These are the advantages of a broker. By and large though, if you only have a few hundred bucks to be investing everyone month why are you putting it in individual stocks anyway? I freaking had no idea about this. Popup ads and TV ads DO make it same like you can only go through a middle man company and can’t buy directly! I enjoyed this article a lot. I learned something I didn’t know about investing – ha – ok there’s lots I don’t know about investing, but I find the subject dreadully boring and in dire need of pictures and cartoons to help make the material less stale. I’d love to hear more from this author. Why not? It’s a great way to reach people who avoid it because it’s boring or they aren’t big into reading and also it can appeal to young people/kids. The earlier you grasp all this, the more time you have to take advantage of compound interest. Me, I like Brokamp’s cat pictures. I don’t think people with such small amounts to invest should be investing in individual stocks. Probably you should instead invest in a broadly diversified mutual fund. You can find low-cost funds with low minimums, which are sometimes waived if you sign up for monthly ongoing investments, often as little as 100$/month. Plus you will never pay a transaction fee if you invest directly with that company. I knew this option existed, but I had no idea how to go about doing it. Once I get out of debt, except for my mortgage, I will be investing on a regular basis (following Dave Ramsey, so no investing until I am out of debt). I expect that after I have contributed to my 403b (maximizing company contribution) and Roth IRAs for me and my wife, I will have a little left over for additional investments, and this looks like a great way to be able to invest smaller amounts in quality companies without paying exorbitant broker fees. Of course I will also adhere to Dave’s advice of using no more than 10% of my investment dollars for individual stocks. I had no idea this was possible. I am definitely going to look into this. I find the topic of investing incredibly boring, but was able to make it through this article, and even learned something. So, well done! Okay, I get it now. “Amy” and “Lisa” are made-up names. Question is: what’s the point? I smell a rat. Don’t feed them [i.e., ignore them] and they’ll go away. … if you look back through other GRS posts, you’ll see I comment somewhat regularly. I don’t know anything about the other poster, Amy. Just trying to give feedback about what I think of the audition pieces. Therefore, if you end up selling these McDonalds shares, you are looking at $50 + $60 in fees right there. Violation!- If your auditioning for a staff writer position, it should be new content or atleast recent content(this year) not an article that is 3 years old. A link to this article would have been sufficient. It might be nit-picking but typically if your are interviewing for such a position you might ask to see many samples of their work over a course of time. We aren’t getting that context only what they are posting and perhaps a link to their own blog. I went back and realized that this also happened with Karawynn Long’s article. At the very least I would say the post should not be something that was previously posted on G.R.S. In essence the audition is an interview so anything goes, but an audition usually is different as your performance is measured against your peers judged mainly on the merit of said performance. I think there is an advantage for those that have previously posted on G.R.S. and no one in this type of forum should be able to rehash old information (regardless of the quality) in the context of an interview. I want to know what the quality of the information they are producing now vs. to be measured against their peers with whom they are competing. John, of the folks auditioning for a staff writer position, three of them will be re-running previous material. I’m well aware of it and so are they (and so will be long-term readers). I don’t necessarily think it’s an advantage; I’m not treating it as one as I evaluate responses. I don’t necessarily think they have an advantage, but I do think it would be better to see current articles (no matter how much I liked this article). If for no other reason, than to see where their perspective is today. So many of the articles are fairly personal, which is their appeal, so unless the old article is still indicative of their perspective then I’d rather see their new content. Afterall, if they’re selected then it’s their new content (presumably) that we’ll be seeing from now on. I actually think it should be a disadvantage. Surely the audition pieces are supposed to show what the author will bring to the site? If the best he can do is to rehash a 3 year old post, sounds like a bit of a one-trick pony to me. I didn’t know you could purchase stocks this way, either. I like the idea but dread having more paperwork to file. Do you know if there is a site that would capture all the individual stocks you own? Does MINT do that? I already have an old 401(k) with Fidelity, a pension account held by Fidelity, and a Charles Schwab 401(k) with my current company. I don’t want any more paperwork but I would like to invest in individual stocks outside of my retirement accounts. Good read. Well written and informative. I would be interested in hearing the author’s rationale for utilizing individual stock purchase plans as opposed to index funds or how these purchases fit in with his larger financial strategy. For example, does the author do a lot of independent research on the companies with which he is investing? I agree that investing in individual companies like this is not something the average investor, let alone a beginner investor should be doing. Picking stocks is hard (and mostly luck). People should be concentrating on diversification via index funds or ETFs and not loading up on any single company stock. I agree. I do have a different perspective on stock and am willing to take on more risk than most on GRS or those that index but DRIPs have their place. Too slow of a process for me and the inability to track results at will on MINT would drive me nuts. Mint drives me nuts at times but I see that they are hooking in to Treasury Direct soon so that small and safe investors will soon be able to track their savings and I Bonds. But, take a stock like Coke or another reliable brand for example. Have a kid research, follow, and invest in a DRIP from a young age and what you have as a result is an excellent learning tool at little cost and, for the most part, little risk. I have my nephew on Sharebuilder with very small purchases. We counter the fees by investing quarterly with his 3 month buildup to lessen the blow of the fee. That works too. How much does this approach complicate tax returns or, should I say, the records needed to prepare the tax returns? For example, would one would be facing a very complex calculation to determine the capital gains on years of monthly purchases? I made some DRIP investments back in the 80s (maybe 70s)and it was a nightmare when I went to sell because I hadn’t kept great records and pc spreadsheets didn’t exist. 1.24 share @ $13.73, .76 shares @ $17.93, etc. Try that with a calculator figuring basis and capital gains. Aggrah! Would be easier today with spreadsheets and if you kept better records. Yes, a hassle! And what’s worse is when individual stocks get bought out or split into different companies etc. I have one share of AOL that I will never sell because of the whole Time Warner thing. It just isn’t worth the ~$20. Of course, you can decide you’re never going to sell because of the tax hassle and then companies force you to figure out cost-basis when they go out of business. Years ago I signed up for DRIP plans with a few stocks. I never followed through with investing much but just activated the DRIP on the initial investments. Multiple accounts from various companies. You have to setup and manage an account with every company you invest in. If you’re properly diversified then you end up with a ton of different accounts. This is a bit of a hassle. These plans are held outside of retirement accounts so you have to pay taxes on your gains when you sell. Theres no tax advantage of this kind of investing and you can’t do it from within a 401k or IRA. Figuring taxes is complicated. When you do dividend reinvestment you buy shares every quarter. Then when you sell you have to account for all of those purchases and then figure out the cost of the shares you bought. THis gets complicated tax time. For example if I buy 100 shares of stock for $10 and sell for $20 thats simple. I paid $1000 and sold for $2000 so I have a $1000 gain. But what if I bought 100 shares in 1980 at $5 and then had DRIP setup for 30 years buying quarterly then I have 120 purchases of small amounts of shares spread over 3 decades. Now figuring your capital gains on that is not so simple. I’ll echo Jim’s comment on taxes. I can attest to that from experience. Love it. Want more of this type content. I like this idea because it reminds me of the ONLY other time we talked about the stock market in school: fifth grade. We picked stocks and tracked them, and saw how much “money” we made over the course of the school year. I’m happy I can actually do that in real life, too. JD this is my favorite audition so far. Wow, I’m always surprised when people find investing boring, or when people are convinced they don’t have time to learn about it. There are very few ways to significantly build and maintain a high net worth without knowing how to invest your money. Decent article, but I don’t like that the author condones automatically reinvesting dividends at market price. This article reminded me of when another author (Robert Brokamp maybe??) talked about the advantages of buying stocks that pay dividends. Since capital gains are taxed at 15%, it was taxed at a much lower rate and (if I’m remembering correctly) was a nice retirement vehicle. Definitely riskier, even if you can avoid too many feeds, but interesting article. I liked it. A nice balance of facts and story. This is great. I had no idea you could do this. I wish I would have known about this before.. This article taught me something which I never knew and would have liked to know. I vote for this staff writer. For 15 years, I’ve been acquiring stocks through DRIP plans. I get started with The Money Paper. They kept running “specials” for people who weren’t members. I paid a $15-$20 processing fee plus the cost of one share of stock. It was the best thing that ever happened to me, aside from my firm’s 401(k). I focused on stocks of companies I knew – McDonalds, Pepsi, and companies I thought sounded interesting – Ottertail Power. Without exception, all have done well for me. At the same time, my banks went public and made stock offerings to me. I’ve done really well with them, too. But with all this experience, I did not know that I could pick up stocks through a company’s transfer agent. I, too, vote for this writer. Finally an article where I learned something new and useful! Great article. I am planning to take this route but have few questions if someone here can answer. In the plan summary of any share there is a electronic purchase service of $7.50 a share for GE. Similarly initial setup fee of $10 & automatic reinvestment fee of $5. My question is does that mean if I plan to invest say $100/month, I will be charge with these fees in every months transaction? The author mentions that he hasn’t paid a dime in any of the fees by going this route. I am not getting that part of it as I can see the fees on the most of the shares that I searched. One of the best pieces of investing advice that I wasn’t aware of! This is why I keep coming back to GRS! – Lays out the premise of the post at the very beginning. Looking at the title I wasn’t sure what this was all about (as I said, I had no clue such an avenue existed). The first paragraph got me hooked. – Gave 5 examples from his own life. Made it personal and anecdotal, while making a point about the benefits and costs of each. This gives the readers a well rounded view of what such an investment entails. Probably one of the most incomplete articles I’ve read on GRS because of the lack of warning as to the tax implications that crop up with DRIP programs. Not that I expect the author to be a CPA, but should at least fully explore the all impications of an investment before submitting the article. Thank you! I appreciate not just this knowledge, but that you’re sharing your personal practices. A balanced and informative piece that helps me as I gather knowledge that will help me dip my toe in the investment waters. GRS: More pieces like this!! Though I wouldn’t mind not paying the $9.99 brokerage fees! I live in Australia, can i purchase stocks from US market? Also, do you know some companies that offers DPP in Australia? I know this is a old post but need some info on dsps. Good to see this posted. I have been buying Kelloggs in a DSPP form for almost 25 years starting as a teenager with money I saved during summer jobs and selling pinestraw. Since then, I have bought into DSPP’s in such companies as GE, Medtronic, Eaton, Wells Fargo and even smaller companies as Piedmont Natural Gas, Stork Industries, etc. My wife and I have done fairly well concentrating on dividend paying stocks over the years usually five stocks at a time. Currently we concentrate on Kelloggs (25+ years on this one), PNY, MDT, ETN & BDX. Given a little discipline DSPP’s are the way to go in the long run. If you enjoy disputing UNAUTHORIZED transaction fees FRAUDULENTLY charged to your account, then transfer agent WELLS FARGO – Shareowner Services is just the corrupt bank for you! In the future, COMPUTERSHARE and AMERICAN STOCK TRANSFER AND TRUST are the only transfer agents I will consider using.